QuickCashWriting.com - Make Money Writing. Write Freelance For Quick Cash. - And Earn BIG MONEY for 5 MINUTES of WRITING! Need a method of turning your writing talents into COLD, HARD CASH... QUICKLY? If so, then I guarantee that this will be the most important letter you've read this year. It'll mean the beginning of an entire new chapter in your life... a chapter where you live the dream of a successful, published writer. And this is a GUARANTEE. So please, read on and treat this letter seriously. You see, the problem with writing is that it can be a very LONG process. If you're a perfectionist, or lead a busy life, you might just find writing a book a little too daunting. Or if you're already writing a book, you'll know that it can take MONTHS before you actually see the result: COLD, HARD CASH. But what if you could get PUBLISHED and earn QUICK CASH... TODAY? NO hours of slogging over a keyboard. NO waiting for quarterly commission checks. NO deadlines. Just write... get published... GET CASH. And the best news? This is all possible, right now... TODAY. You don't need any experience and you can start earning CASH almost instantly -- once you discover the niche industries that are CRYING OUT for people like you to write for them. The great thing is that the VAST MAJORITY of writers have NO IDEA about these little-known writing markets. Only a handful of writers are truly aware of the potential... and are earning a fantastic income by tapping out words on their home computer. You can join them, working just five minutes a day. The industry needs YOU. Are you going to let your chance to become a published writer pass by? Nick Daws is the author of over 70 best-selling books. He wrote the hugely popular "Write Any Book in 28 Days!" course and knows the writing industry better than anybody else. He knows the PEOPLE you need to know. And in his latest course, Quick Cash Writing, Nick wants to personally show you EVERYTHING you need to make a GREAT living as a freelance writer. Yes, MOVIE PITCHES. Your name could be on the next blockbuster by simply writing THREE LINES ... Nick shows you how. And he talks from experience. HIS SECRETS WILL AMAZE YOU. These jobs require almost ZERO effort, and will put you on the writing fast-track for quick CASH! Over twelve jam-packed modules, Nick's course takes you from the basics through to more and more EXCITING writing jobs. And you don't need ANY experience to get started... if you can string a sentence together, and you have the Quick Cash Writing course, you're READY to GET PUBLISHED. Nick Daws uncovers dozens of secret writing markets in his course, explaining EXACTLY how you can exploit them for MAXIMUM RETURN. The goal is on making the most cash with the least amount of effort. ... AND IT'S EASIER THAN YOU'D THINK! In fact, some of his techniques are so easy, you'll probably feel GUILTY accepting your paycheck. Some of his ideas are so shockingly SIMPLE that you'll really wonder why no-one ever told you about these hidden markets before. And some of his suggestions literally WORK THEMSELVES... you really don't need to do ANY work . Just collect the cash and call yourself a writer. Nick begins the course looking at writing in general, and exposes how you can get started in the understated world of fillers and readers' letters. It's EASY MONEY for a tiny amount of work. And Nick will unveil ALL the insider secrets NO-ONE ELSE wants to tell you. TEN GREAT WAYS to find more time to write – even with the most hectic lifestyle! Yet another INEXHAUSTIBLE source of ideas for readers’ letters. "After starting three novels and never finishing, I can't believe what I've discovered. In the few hours I spent writing, I completed FIVE fillers -- and have confirmation that two of these will be published in Bella next week! You've made my dream come true, Nick. God Bless you!" "Very impressed with the course content and depth. Wow! Really looking forward to putting all of this great information into action!" ... and it all keeps getting MUCH BETTER. It doesn't matter whether you live in the United States, the United Kingdom, Australia, New Zealand or Canada, there are SECRET writing markets out there that are simply BEGGING for people like you to write for them. And all it takes it a FEW MINUTES EACH DAY. Nick's course moves on from simple letters and fillers to explore EXACTLY how to exploit the greetings card, slogan and photography markets... allowing you to earn BIG MONEY with minimum effort. --- This one is a REAL BEAUTY!! "I never had any idea this could be so easy. Stop sharing your secrets, I don't want anyone else to know how to do this! Mr Daws, you are a genius. Last week I won a case of champagne for one line of writing when using one of your 'Chestnuts.' Really very much impressed"
So you want to be a REAL WRITER? Let Nick Daws unveil the secrets that'll enable you to show off your writing talent... and STILL make BIG money, working just a few minutes each day. Read on as Nick Daws gives you the complete inside scoop on writing magazine reviews, newspaper articles, short stories and even COMEDY... and shows you how to do it the EASY WAY to GUARANTEE you'll get published AND earn great money, with absolute MINIMUM effort! "Great news! I've had a number of my comedy sketches accepted for production for a new [major radio station] comedy series, plus had a short story mystery published in [a women's magazine] last week. This was probably the best investment I ever made, you've already made me one of the happiest women on the planet, Nick -- I'm envious of your wife!" "Hi Nick! Just want to say I bought your 'Quick Cash Writing' guide, and I just made my first 50 US dollars today. Living in South Africa that's a lot more than just a 50. It's really a great book. Thanks for everything!" If you think that's enough to keep you busy, you'd better RETHINK. With over 100,000 words, the Quick Cash Writing course is Nick's largest EVER delve into the writing industry. He exposes brand new markets that most writing courses SIMPLY HAVEN'T YET DISCOVERED. Just read on to learn a few of the extra SECRETS Nick unveils, demonstrating how you can earn OUTRAGEOUS MONEY by designing anything from crossword puzzles to television shows. Plus, he'll tell you how you can submit a simple idea to Hollywood -- and earn THOUSANDS in royalties and get your name in the credits of the next blockbuster film! Nick gives you the MARKETS and the CONTACTS that NOBODY ELSE wants to share! "Please use this as a testimonial, Mr Daws. Your tips and contacts list are great. I typed up a number of ideas one evening and submitted to a few production companies. I've actually received two follow-up replies. I'm ecstatic!! I can tell I'm on the verge of something big, thanks to you!!" ... As Nick Daws takes your writing career to the NEXT LEVEL. He'll show you how to make even MORE money and gain BIG TIME EXPOSURE for your writing talent. There are a whole bundle of BONUS markets you can exploit to make cash, FAST... all working from the comfort of your own home. ... And it only takes a few minutes each day. ANYONE can do it! "I've really started to use some of the tricks you share. Wow, I never realized there was so much I didn't know. Your book is crammed with information, literally stuffed with little-known tricks. I don't know how I survived before this and I want you to use my words as a testimonial... please!" "I bought this course after reading Nick's 28 days book. And it's great -- Nick has jammed it with insider information that helps you make real cash, real quick. I've already been paid for three pieces of work using his techniques. Powerful -- I cannot wait to buy the next course -- thank you, Nick!" ... Working just a COUPLE of MINUTES each day! This is one HUGE collection of secret markets, all TOTALLY EXPOSED in one exciting course from best-selling author Nick Daws. He'll take you by the hand and personally show you how to exploit EACH market, step-by-step. Nick will tell you EVERYTHING you need to know. From writing reviews to getting your stories pitch to Hollywood, you'll learn it ALL. Plus you'll get the FULL support of our writing team at myHelpHub.com. And all for JUST $39.95. NO gimmicks, NO tricks. Just one LOW PRICE. PLUS... Here's our special Wednesday offer!! NICK'S PERSONAL BLACK BOOK - BONUS! Here's your ONLY CHANCE to own Nick's personal worldwide directory of magazines and newspapers. Each publication accepts the articles and filler items that Nick SHOWS you how to write! His directory includes OVER 150 PUBLICATIONS from the USA, Canada, UK, Australia and New Zealand, all accompanied by Nick's PRIVATE contacts and notes! NICK'S MINI-INSPIRATRON MACHINE - DOUBLE BONUS!! We're also sending all NEW customers the FULL version of the Nick Daws Mini-Inspiratron. This is the EXCLUSIVE inspiration-providing tool designed exclusively for the Quick Cash Writing course. Just click the button to generate ideas automatically! TEN FREE SOFTWARE TOOLS - TRIPLE BONUS!!! Want more? We're giving away TEN FREE software tools to ALL readers of the Quick Cash Writing course! When you purchase TODAY, you'll receive software to speed up your writing, record your ideas, generate plots, boost your productivity, rocket your creativity, and MUCH more. And it's all FREE to you! !!! BUT THIS OFFER IS LIMITED !!! In order to ensure EXCLUSIVITY, and in accordance with instructions from Nick Daws, we're only releasing 1000 copies of the Quick Cash Writing course. So if you want YOUR copy, with ALL the freebies, then you ABSOLUTELY need to purchase BEFORE midnight Wednesday! Click HERE to buy the Quick Cash Writing course... NOW! Want to get started with the Quick Cash Writing course... within the next FIVE MINUTES? Nick promises you'll earn at least THIRTY TIMES the amount you paid for the course within three months -- or YOUR MONEY BACK! There's NO small print and NO tricks. We 100% GUARANTEE your success! See our FAQ page for full details of our total guarantee. Want to get started... RIGHT NOW? You absolutely CANNOT LOSE when you learn with Nick Daws. Almost 100,000 words of advice & SECRETS from a best-selling author! 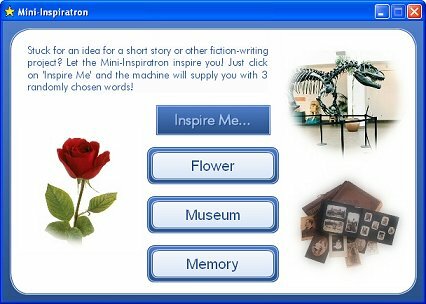 The Mini-Inspiratron software, so you'll NEVER be stuck for ideas again! Ten exciting FREE software tools to make your writing life EVEN EASIER! Where else could you get personal advice from a world-leading expert for JUST $39.95? You won't find a best-selling author ANYWHERE willing to give you even TEN MINUTES of his time for that price. But with the Quick Cash Writing course you get ALL of Nick Daws' knowledge, wrapped up into one NEAT package. Do you WANT to get published AND get paid... STARTING TODAY? Click HERE to buy Quick Cash Writing, RISK-FREE! Access details will be delivered via email immediately after purchase. Cost: $39.95. Remember, we can ONLY guarantee this offer while these links remain active. Once the course has filled up, we will no longer be offering the Quick Cash Writing course. BUY IT NOW! I hope you decided to discover the Quick Cash Writing course, or at the very least subscribe to the free mini-course offered near the top of this page. This might be the LAST CHANCE you get to get published AND earn big money, working just a few minutes each day. If you're serious about writing, check out Quick Cash Writing today... RISK FREE! CLICK HERE! PS. Remember, you DON'T need to be Shakespeare to begin using Nick's techniques. All you need is a pen, a sheet of paper - and a little enthusiasm. Nick provides the rest. And it's all TOTALLY risk-free. Interested? Then click here to discover how to begin enjoying Quick Cash Writing! PPS. You have NOTHING to lose by accessing this the course. Remember, our FULL guarantee means you MUST earn AT LEAST $1198.50 within the next three months -- or we'll BUY BACK your course from you. No quibbling! Click HERE to get access to the Quick Cash Writing TODAY! PPPS. If you haven't yet discovered the magic of Nick Daws, check out his best-selling course "How to Write a Book in 28 Days - Or Less!" If you're considering writing your first book, you'll be AMAZED at how easily it can all fall together. Check out Nick's amazing testimonials - then decide whether you want to give Quick Cash Writing a go!